Average annual rainfall : 100 to 500 mm. 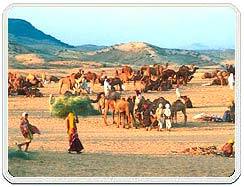 The Thar Desert is located in western India and southeastern Pakistan. The huge unending expanse of burning hot sand is spread over four states in India, namely Punjab, Haryana, Rajasthan, and Gujarat, and two states in Pakistan covering an area of about 446,000 square kilometres. It lies mostly in the Indian state of Rajasthan, and extends into the southern portion of Haryana and Punjab states and into northern Gujarat state. The desert is bounded by the Aravalli hills in the east, by the fertile Indus and the Nara valleys of Pakistan and the salt marsh of the Rann of Kutch in the west, and by the alluvial plains of Haryana and Punjab in the north. It is believed that aeons ago, Shri Ram drew an arrow in his bow, targetting Lanka, the island capital where his wife was held captive by the demon king, Ravana. However, such were its destructive powers that the gods pleaded with the Lord to desist from his intended purpose. But the arrow once drawn could not be pulled back and thus Rama pointed the arrow to a far-flung sea. The heat generated by the arrow dried the sea and and in its place arose a dry, arid and hot desert. The origin of this desert is a matter of much controversy. Some consider it to be only 4000 to 10,000 years old. Many others believe that the region started becoming arid much earlier. 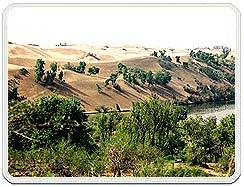 Another theory states that area turned to desert relatively recently: perhaps around 2000 - 1500 BCE. Around this time the Ghaggar ceased to be a major river. It now terminates in the desert. It has been observed through remote sensing techniques that Late Quaternary climatic changes and neotectonics have played a significant role in modifying the drainage courses in this part and a large number of palaeochannels exist. 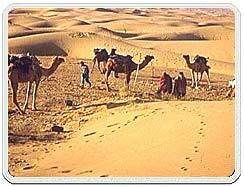 In North-west India, the Thar desert region of Rajasthan is one of the most inhospitable landscapes on earth. Apart from the huge distances between hamlets and settlements here, the landscape is constantly shifing with the sand, as wind and sandstorms re-arrange the terrain at will. Community workers here live and work in this vast, arid, sprawling and shape-changing environment. The region has great diversity in vegetation .As many as 700 species of plants are found in the area, of which 107 are of grass alone. The local grasses are generally prolific seeders, and most of the species are palatable, fairly nutritious and rich in minerals, including trace elements. These also have medicinal value and hence alkaloids, used for making medicine, and oils for making soap, are also extracted therefrom. There is a great paucity of water and hence, the thar desert vegetation is mostly herbaceous; with the trees very rarely dotting the landscape. On the hills, Gum Arabic Acacia and Euphorbia may be found. The Khajri (Prosopis Cineraria) tree grows throughout the plains. Water is very scarce. Land-use in the Thar is dependent on rainfall. In good rainfall years, large areas are cropped, cattle thrive on extensive pastures and substantial amounts of hay are stored for future use. Rainwater is stored in ponds and underground tanks. As rainfall is very erratic, a pattern of mixed farming has been developed in which human and animal populations benefit from each other. The Thar Desert is endowed with some of the best breeds of livestock in the country. Nearly 50 per cent of the country's wool is produced in Rajasthan, and the area has been the main supplier of bullocks to the North. The area receives very scant rainfall, with the average annual rainfall varying from 100 to 500 mm. Receiving an annual average rainfall of less than 10 inches, the desert is a largely a sun-scorched region of shifting sand dunes, broken rocks, and scrub vegetation.During the months of July and September, around 90% of the rainfall attributable to southwest monsoon. There are wide fluctuations in the amount of rainfall from year to year. The mean average temperature varies from a minimum of 24 to 26 degrees C in summer to 4 to 10 degrees C in winter. Dust storms and dust raising winds blowing at very high velocity are very rampant. May and June are the hottest months of the year while January is the coldest month. The soils of the Arid Zone are generally sandy to sandy-loam in texture. The consistency and depth vary according to the topographical features. The low-lying loams are heavier and may have a hard pan of clay, calcium carbonate (CaCO3) or gypsum. The pH varies between 7 and 9.5. 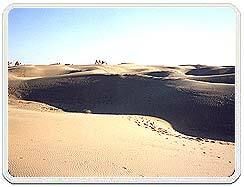 The desert soils occupy the districts of Jodhpur, Bikaner, Churu, Ganganagar, Barmer, Jaisalmer, and Jalore. 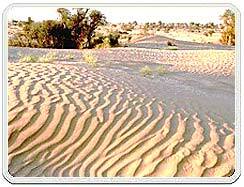 The Thar consists mainly of the wind-blown sand. The area is covered not only by sheet of sand but also of rocky projections of low elevations which constitute the older rocks of the country. Water is scarce and occurs at great depths, from 30 to 120 m below the ground level. Some of these soils contain a high percentage of soluble salts in the lower horizons, turning water in the wells poisonous. Being poor in organic matter they show a low loss on ignition. They contain varying amount of calcium carbonate. About 23 species of lizards and 25 species of snakes are found here. The thinly populated grasslands support the endangered Great Indian Bustard, the Black Buck, the Chikara (gazelle), and some feathered game, notably the Francolin and Quail. Sand Grouse, Ducks and Geese are common among the migratory birds. There has been a tremendous increase in human population as well as animal population, in past years. The increase of human and livestock population in the desert has lead to deterioration in the ecosystem resulting in degradation of soil fertility. The Indian Desert is mainly inhabited by Hindus, Muslims, and Sikhs. The portion in Pakistan is inhabited by primarily by Sindhis and Kolhis. There are around 60% Muslims and 40% Hindus in the Pakistani part of the Thar Desert. The living standard of the people in the desert is low. The people have a great passion for music and poetry.